In my last post I talked about the Fire TV Stick, the product category and competition, and how the initial setup went. Today it's time to get down to business and watch some content from some different sources. First off, as I mentioned before, Amazon is going to push their own content, so rentals/purchase from Amazon are right up front. If you're an Amazon Prime member, you're going to get a healthy dose of Prime Instant Video. While we are Prime members, we haven't really spent a lot of time using their content. TiVo has never supported Prime Instant Video (it does support the digital purchase/rentals, which we have used at times), so before our recent TV upgrade, using Prime Instant Video meant switching to our Blue-ray player's Amazon app. Combine that inconvenience with the fact that early on there wasn't a lot that we wanted to watch, especially compared to what was available on our Netflix account, and we just haven't had a reason to pay much attention. The 2014 announcements of HBO's older catalog of shows and 4k content has had my attention, and with our 4k Smart TV purchase supporting the full gamut of their content, I've been intending to dig in, but I'm still not actively watching anything inside their ecosystem. Out of the gate I jumped into It's Always Sunny in Philadelphia. It's a show I've always watched in bits but never from start to finish, and Amazon tossed it up in my recommended list. I jumped in with Season 1, Episode 1. Out of the gate the first thing I got was an HDCP error. HDCP stands for "High-bandwidth Digital Content Protection" and is basically the copy protection scheme used to keep you from copying digital video from your HDMI cable. Apparently the Fire TV Stick didn't handshake properly with my ancient HDMI 1.2 (I think?) TV. I solved the problem by unplugging the device from the HDMI port and plugging it back in, which would, of course, be a horrible solution if the TV were mounted on the wall. We will see if this is recurring, but I'm willing to give the Fire TV Stick the benefit of the doubt at this point because I've had some issues with this TV switching between sources in the past. While I was diagnosing this, I managed to figure out that a software update had been installed overnight after the initial install and that the time zone was set for PDT instead of CDT, which was easily corrected in the settings menu. I puttered with the various settings but it seemed like the defaults were, in fact, correct. Playing S1E1 of Always Sunny went as expected. It was from 2005 and in SD, so I hopped forward to S5E1, which Wikipedia reports to be in 720p. The video was 16:10, but relatively low quality, which is probably a function of Amazon's compression level, or maybe the original source material. My TV reported it coming through in 1080p, and I don't think that the clarity issue looked like anything related to scaling up. Jumping forward to S6E1, 1080p per Wikipedia, improved the quality quite a lot. Now we were clearly dealing with a decent HD stream. The quality differences seem to be all about Amazon's encoding, and not about the Fire TV Stick, which seemed to do its part of the job just fine. Switching between the episodes we smoothly. I'm not sure if this happened because of their predictive downloading -- Amazon calls it ASAP, or "Advanced Streaming and Prediction," and says that the Fire TV products will guess what you're going to watch next and download parts of shows in advance so that you don't get a buffering message at beginning -- or if it was just because everything was going particularly smoothly with Time Warner Cable and Amazon's CDN (Content Delivery Network). Good times. Next I hopped out of Amazon's content and selected the "Netflix" logo under "Apps and Games." As I mentioned in the last post, everything but Amazon's content is supported by downloadable apps. This actually isn't all that much different from any other similar device, but the segmentation of the interface is made more apparent. Amazon content is front and center, and everything else is elsewhere. Some reviews I've read have also mentioned that the search features don't search everything, which isn't really surprising once you see that their apps are the only ones truly integrated. I confirmed this today. The first thing I had to do was download the free Netflix app, after which I could open it and get the opportunity to sign in. And... No. I'm not doing this. I can accept pecking through an onscreen keyboard with a remote control for a wifi key, but I'm not doing it again. I haven't done that since, well, at least since TiVo's iOS/Android apps became tightly integrated and allowed me to use my iPhone/Kindle Fire/iPad as my keyboard, and that was several years ago. I could probably pair a Bluetooth keyboard, but I don't have one. 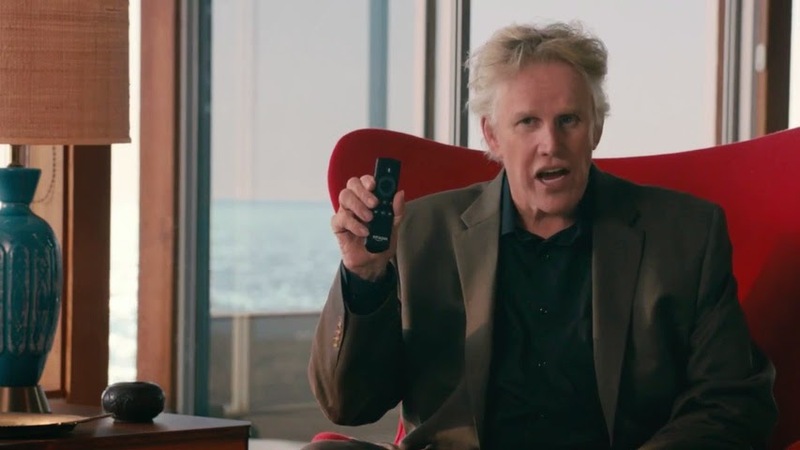 Wait, remember Gary Busey talking into his remote control? I don't watch many TV ads and I recall those... You don't get that remote. Sure, you can buy it for $30: Voice remote for Amazon Fire TV and Fire TV Stick. Uh, no, I'm not spending another $30 to be able to talk to my remote. That's OK. This is 2014, and there's an app for this. Right? Well, if you're a strictly iOS household, the answer to that is "soon." I have faith that Amazon will deliver on soon, but for now, our iPads and iPhones are useless to control the Fire TV Stick. Here in The Lab there are alternatives. We actually have 3 different Kindle Fires: a 2011 Kindle Fire (the original model), a 2012 Kindle Fire HD 8.9, and a 2013 Kindle Fire HD 7. This is actually a good selection, as it includes all 3 versions of the Fire OS Android fork. The 1st gen was never updated past the original OS based on Android 2.3, the 2012 Fire HD still runs the 2nd generation Fire OS based on Android 4.0, but the 2013 Kindle Fire HD 7 is actively being updated and received an upgrade to Amazon's latest OS version a few months ago. The old 1st gen, 2011 Kindle Fire is just hanging out being used for occasional bedtime stories, so I figured I'd try it out first. Finding something useful for it would be nice. Unfortunately, the Fire TV app isn't available for this device. It still runs an Android 2.3 fork, and, while Amazon released a 2nd gen version of the device running their Android 4.0 fork, they never updated the early devices. I won't rant further. Maybe the 2012 Fire HD will work? BINGO, Fire TV app in the Amazon app store for this device. Of course, this adds insult to injury on the lack of update for the 1st gen Kindle Fire... No, I said I wouldn't rant. Basically, any Kindle Fire except the very first one they ever sold should support the app. Except, wait, the 2013 Kindle Fire HD DOESN'T support the app? I have no idea why. I fire up the app and it searches and finds "Colin's Fire TV Stick" to pair with. I select it, 4 digits pop up on the screen, I touch them on the Kindle Fire screen and I'm in business. I get a little tutorial and a "start" button. One tidbit from the tutorial is that with the app I CAN be like Gary Busey and talk to this thing. Do I want to? I hit start and navigate to the Netflix App, which is now in the "recently used" part of the interface. Now I can use app for the keyboard interface, and after entering the wrong password only one time, I'm logged into the Netflix app that looks pretty much like all the current iOS/Android/SmartTV Netflix apps. I kind of dig the app's remote interface. It's basically a big touchpad and you touch and drag to move around. The TiVo app has an interface option like this and I've never bothered. Note to self, bother. This is really intuitive. Oh, nearly every time I reopen the app I have to select "Colin's Fire TV Stick" again. Not so intuitive, Amazon -- there's only one on my network. I jump into my Netflix profile, and the last thing I watched was one of their 4k demo videos. I start it up and get another HDCP error on the screen. I cycle TV power and the video is playing. This thing is going to make me pay for the quirky old TV, but it's probably not really Amazon's fault. Maybe they can figure out how to be more forgiving? I used to only have issues when I changed between certain devices, but it looks like this is going to happen a lot. Maybe not since the problem goes away when TV power is cycled, maybe it's just happening because the TV has been on continuously while I've been in and out. As I ponder all of that, pretty trees and rivers slide by to violin music in 1080p. The Netflix app gets a thumbs up, as expected. What now? There are a bunch of other streaming apps that are supported, and I use exactly none of them. HBO Go ISN'T supported yet, but will be early in 2015. Hopefully in time for Game of Thrones. What to test next? I ordered an Amazon Fire Game Controller, but it hasn't arrived yet, so I won't hit up gaming, where I'll admit that my expectations aren't high. Along with Netflix and Prime Instant Video, playing my personal media is the most important thing to me. We have a Synology Rackstation with 10+ TB of storage, and I want to be able to play video from this storage device. The Rackstation is a DNLA (Digital Living Network Alliance) device and my Samsung smart TV, for instance, has no trouble playing media shared through its media server. The Fire TV Stick, on the other hand, has no built in support. I get online and start looking for how people are solving this problem, and it's basically a hot mess. There are some apps that people suggest trying, some of which also enable screen mirroring with Apple devices via AirPlay, but nothing solid. That's just not cool at all, Amazon. I know you want me to use your content services, but it's 2014, and not having a canned solution for playing content from a DNLA media server just isn't cool. I know it's a $40 device, but there's no good reason for this functionality not to exist. Even Apple, who is the king of keeping people inside their ecosystem, gives you some functionality here on their Apple TV. OK, so my Rackstation also has a Plex server capability, so you can shell out $5 for the Plex app and be OK, plus if you buy the app you have it on any Kindle Fires or other Android devices you link to the Amazon App Store, as well. It just shouldn't be necessary. Plex is nice, but Amazon needs to step up and fix this. Due to the Amazon's leveraging Android Open Source Project, and Google's commitment to make sure that all Android devices utilize as much proprietary Google content as possible, no Amazon devices have access to the Google Play versions of the various Google apps. Because of this, I wasn't sure what to expect. It appears that Google is treating the Fire TV products like smart TV's and the app looks a lot like what we have on our Samsung TV. If you haven't used the newer YouTube smart TV apps, you'll find that things have gotten very mobile friendly. You can pull up the YouTube app on your mobile device and search through videos and then "cast" them to your TV. I was able to do this from both my iPad and iPhone, but did find that if I was already in the YouTube app, the video wouldn't necessarily play correctly. If I was in the main menu it would open the YouTube app and work correctly. I assume that these rough edges in the YouTube app will get cleaned up. I pull up Amazon's music app. For some reason I have some music in there, and it plays and keeps playing while I browse through the menus some more. I could also play music from Amazon's Prime Music service, which competes with various music streaming services and comes with Prime. Oh, I have to go on the website to set it up because I've never bothered. I sign up and add a Christmas playlist. It doesn't show up on the TV. I go in and out of music while Frank Sinatra sings in the background. No joy. Finally after a few minutes Prime Playlists shows up in the music app and I start up the Christmas playlist. Note to Amazon: this needs to work more like Pandora, Spotify iTunes Radio, etc. and less like iTunes from 2010. I'm sure they're working on it, and it's not bad, but it could use work. I go into settings and turn on screen mirroring to try it -- and the Fire TV app stops working and I have to go find the physical remote. Oh, it's at my desk, I haven't used it since I fired up the app. There's a link to an Amazon web site on screen mirroring. It turns out that the 2012 Fire HD doesn't support screen mirroring. It looks like the screen mirroring uses Miracast, which requires Android 4.2 or later. Fire HDX devices support it, according to Amazon's web site. Our 2013 Fire HD runs the same OS, but doesn't support it, so I can't test it. While I'm trying to figure out this, I find Prime Music Ad-Free Stations. So maybe there is something more like Pandora/Spotify/iTunes Radio? I knew Amazon couldn't be that bad, but after a little digging I find that I can listen to the stations in a web browser, and that Kindle Fire tablets running the current generation Fire OS were updated in November to support it, including our 2013 Kindle Fire HD, but not our older Kindle Fire HD, which only lets you play from your library and Prime playlists. The Fire TV products don't yet have this feature but are getting it "soon." Fair enough, this is important to Amazon so I expect this to work soon. In the meantime there is a Pandora app, but the Spotify app isn't a full blown version of Spotify, only a way for you to play music from your phone or tablet. Meh. Beyond that, there are a bunch of apps that I can't really review because I don't use them, don't have accounts, etc. My guess is that they mostly work pretty well, but if you have some specific app like Flixter or PBS Kids or NBA Game Time that is important to you, I'd check out the Amazon App Store reviews to be sure. Also, take the reviews with a grain of salt. The Watch ESPN app has terrible reviews. Why? You have to have a pay for a TV subscription that includes ESPN to use it, and apparently this has made a lot of people who thought they could order a Fire TV and get ESPN quite unhappy. I had no trouble logging into my Time Warner Cable account through espn.com, pairing my Fire TV Stick Watch ESPN app and watching a live basketball game. You expect to be able to conveniently access all media without a cable subscription. The world is moving that way, with HBO having announced that they will sell standalone subscriptions for an HBO Go like service in the future, but we're not there yet. On the whole, for $39 I think it's almost a really, really great product. There is still some polish missing in some of the software, like YouTube videos not always starting when cast and a Kindle Fire remote app that regularly wants me to reconnect and isn't supported on my iOS devices or even on my newest Kindle Fire HD. Also it is still short HBO Go, a full Spotify app, and a few other things. The hardware seems solid, and I think this is important enough to Amazon strategically that much of the rest will likely be cleaned up over the coming months. That said, as the owner of several of their devices, I'll say that Amazon doesn't have a perfect track record with software, so I won't be surprised if one or more of these holes remains 6 months from now. There are also games, but I'll be messing with them once I get the Amazon Fire Game Controller in a week or two.